I have entered a long trade in the US Dollar index on the 60 minute time frame. I have observed that an MACD divergence is forming in this time frame, in addition to prices settling above my moving average on the daily chart. These combined factors prompted me to enter a trade. Trade entry occurred at 19:34 at a price of 83.055. I'll be using a trailing stop until it is either triggered or until my target of 84.00 is reached. Let us observe the 60 minute futures chart for the September US Dollar index contract. 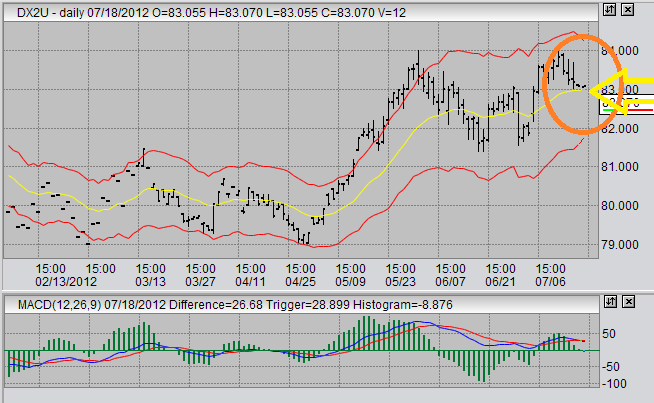 Here we are seeing prices make 3 bottoms in the 83.05 area, the lowest was at 83.03. The MACD has steadily risen as these bottoms have played through. To me, this is an MACD divergence and merits a bullish entry. Let us now observe the daily futures chart for the September contract for US Dollar index futures. We can observe here that prices have settled just above the moving average I have set here on the daily time trading time frame. What I am looking for is a bounce off the moving average, and the MACD divergence on the 60 minute charts is giving me a clue that this may occur. I will be targeting a sell zone of 84.00. As is clear on the daily chart, prices have topped at 84.00 twice in the recent past. We can also see that the MACD has been in decline over the course of these two previous tops. If things work out the way I am hoping, we will likely see a good shorting signal in the USDX futures at the 84.00 level. In other markets, my Australian Dollar trade was a failure. The entry was premature. I have been stopped out of that trade. I am still looking for a sell in that market, but for now I will be waiting and seeing. I'm still in my short position in the 10 year US treasury notes trade. I'm looking to hold this position as I am still convinced we will see a drop in prices soon. However, I will exit this position if it moves to far against me. For now, it is bouncing around break-even and my opinion remains unchanged. Regarding my t-notes trade, my entry was way off in terms of the 60 minute charts. I've always had difficulty in that time frame for that product. However, its the daily and weekly charts that have my attention in that product.